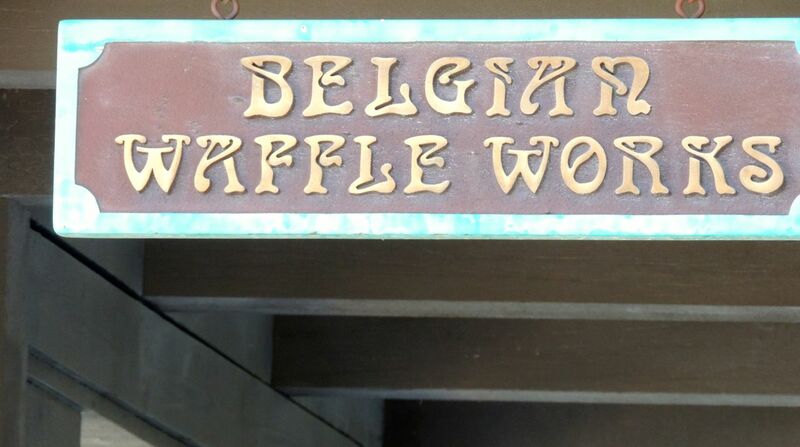 We're in Lake Arrowhead for a few days, and no trip here is complete without a stop at Belgian Waffle Works. This definitely isn't a place for diets! I love the location by the lake. 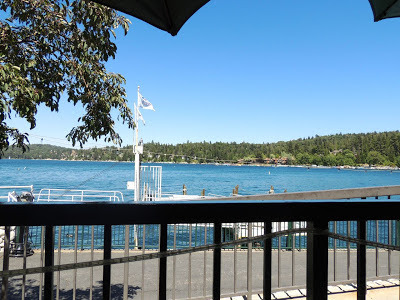 They have indoor and outdoor seating, but we always choose to sit on their outdoor patio. They have umbrellas for shade, and they have heaters in case it gets chilly. 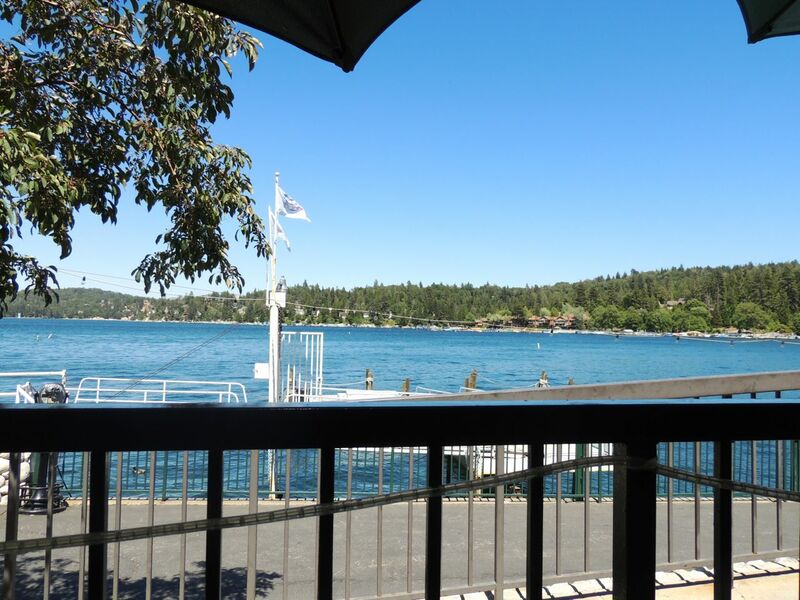 I love watching the birds, ducks and boats while sipping coffee and looking over the menu. 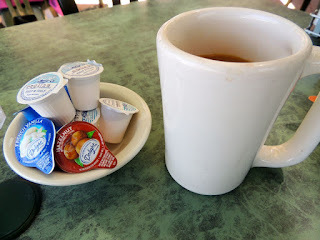 Speaking of coffee, when I know a restaurant has flavored creamers (french vanilla, hazelnut, Irish creme, etc) I'm MUCH more likely to order coffee. Otherwise, I think it's a complete ripoff since I know I could buy a bag of coffee at the grocery store for about the same price as one cup at a restaurant. I know they sell flavored creamers at the grocery store too (I buy them), but somehow knowing that I can get them at a restaurant adds so much to the experience. Am I the only one who thinks this way? Anyway, Belgian Waffle Works gives you an assortment of creamers (some flavored, some not flavored) with your coffee, and coffee goes really well with waffles. If you're like me, you'll just have to get a cup. They're ready with the refills too. There are many options on the menu including over a dozen types of waffles plus sandwiches, salads, etc., but as our waitress said today, "Waffles are what we do!" They do waffles well, and they serve them all day. I think my husband and I both said "Wow" when our food arrived. 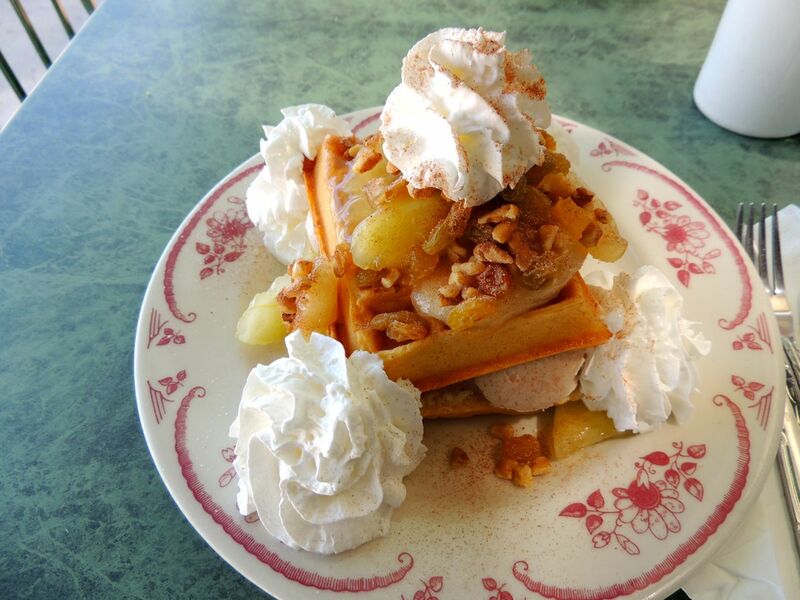 After debating between the Peach Melba Belgian, the Apples Normandy Belgian and the Hot Apple Annie, I decided to go with the Hot Apple Annie: a waffle topped with cinnamon ice-cream topped with another waffle topped with hot apples, raisins, walnuts and whipped cream. It's like calling dessert a meal. It was a little hard to eat with the ice-cream sandwiched between the waffles, so I ended up disassembling it. 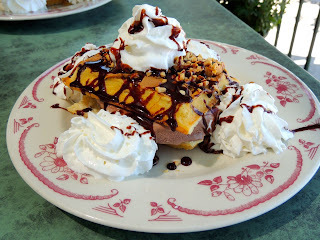 My husband ordered the Peanutty Belgian: a waffle topped with chocolate ice-cream topped with another waffle topped with peanut butter topped with peanuts, chocolate syrup and whipped cream. He loves peanut butter cups, so this was the perfect waffle for him. My parents owned a bakery when I was growing up, and I remember parents coming in with their kids and telling them they could have whatever doughnut they wanted for breakfast but that they couldn't have a cookie. That always seemed odd to me because a doughnut is no healthy than a cookie. They're both basically like dessert. That's probably one of the reasons I love breakfast food so much; it's like dessert. The waffles at Belgian Waffle Works are no exception. I thoroughly enjoyed my waffle/dessert this afternoon!